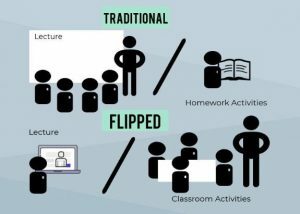 The Flipped Classroom is a teaching model where the core idea is to “flip” the instructional approach. Students are asked to complete the readings and watching the lectures at home and come to class ready to complete active learning activities related to the coursework. Create quality pre-recorded lectures that relay the course content effectively (substantial pre-planning and prep work required before pilot semester). Reduce lectures to manageable segments (about 15 minutes). Develop classroom activities that promote Active Learning. Students should be applying the knowledge gained from lectures and readings. (i.e., case studies, debates, discussions, group projects, problem-solving, presentations, individual assignments, educational games). Avoid “busy work” to simply fill the time. Be available during class time to assist and facilitate. Circulate, be prepared to guide and encourage active learning in a student-centered environment. Interact with the class. Eberlein, J. Kampmeier, V. Minderhout, R.S. Moog, T. Platt, P. Varma‐Nelson & H.B. White (2008). Pedagogies of engagement in science: A comparison of PBL, POGIL, and PLTL.